What are some of the most dangerous professions? Jobs in Industries that deal directly with unpredictable elements—like firefighting, law enforcement, or construction may immediately come to mind. While these typically top the list of The Most Dangerous Jobs in America, a new survey identifies another profession where health risks and injuries are unfortunately all part of a day's work—it's nursing. Nurses put the care in "health care." If you've ever had any sort of medical treatment, from major surgery to a routine check-up, a significant portion of your care was likely provided by a nurse. There are more than 3.1 million registered nurses in the United States, making it the nation's largest health care profession. Sadly, these dedicated and caring individuals are also some of the most likely to become injured because of their chosen career. According to the Department of Labor's Bureau of Labor Statistics (BLS), registered nurses rank among the top five occupations with the most workplace injuries. These injuries can occur as a single event, but more often than not, the long-term effects of years of repetitive exposure to health risks makes nurses susceptible to a wide range of health conditions. Nurses stay on their feet for long hours at a time, which means physical strain poses one of the biggest risks to nurses. Lifting and transferring patients is also risky, and is the most common cause of back injuries among health care workers. Nurses experience work-related musculoskeletal injuries at a rate of almost seven times the national average. There are over 35,000 back and other musculoskeletal injuries among nursing employees every year, and many of these are severe enough to result in missed work days. 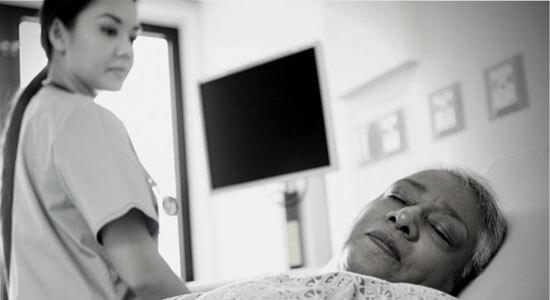 The problem of understaffing in the health care industry creates many unsafe conditions in a nurse's workplace—the most common is chronic overtime. In Pennsylvania, a health care facility can no longer require employees to stay on duty after finishing their work shift, except in a national, state, or municipal emergency. All states have at least some restrictions on nurses' mandatory overtime, but today nurses still work a greater number of overtime hours relative to other industries. Since nurses provide such vital care to patients, hospitals cannot afford to leave floors understaffed if an employee suddenly calls off. So, although overtime isn't mandatory, hospital administrators still regularly ask nurses to voluntarily work hours in addition to their scheduled hours. Working just one shift in a highly-skilled, hands-on nursing position requires substantial energy. Nurses need to be able to rest and recharge between shifts, and working chronic overtime hours severely hinders this process. Nurses don't always follow the typical 9 to 5 schedule, and many are driving home from the night-shift when the rest of the world is just leaving for work in the morning. Fatigue combined with driving during twilight hours, when visibility is at its worst, could cause car accidents. In a 2014 survey, three out of four nurses reported experiencing violence on the job—either verbal or physical—within the past year. Undergoing physical or verbal abuse at work can have serious, long-term effects on employees. Violence in the workplace is one of the top concerns for nurses, especially those working in Emergency or Psychology Departments. Hazardous chemicals associated with all sorts of acute and chronic health problems are still used widely in health care facilities throughout the U.S. They come in many forms, from cleaning products, disinfectants, sterilants, and formaldehyde, to dangerous gasses like Freon or waste anesthetic gases. If nurses are exposed, they could suffer acute asthma attacks or other side-effects. Pregnant nurses face additional risk to their unborn babies from exposure to these chemicals. It is unlikely that health care facilities will ever be able to remove all hazardous chemicals, but attempts should be made to use safer alternatives where possible. 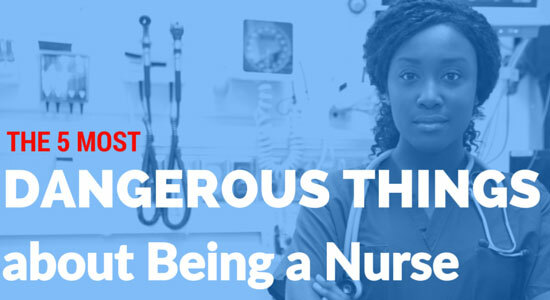 Nurses dedicate their lives to caring for patients, but sadly the dangerous factors in their workplace put nurses at risk for becoming patients themselves. At our law firm, we stand up for the rights of injured workers. If you've been injured at work make sure you get the compensation you deserve. We're always here if you need legal help. Sources: “ANA Panel Aims to Prevent Violence, Bullying in Health Care Facilities.” Nursingworld.org. April 6, 2015. “Health Care Workers Unprotected”: Clarion Call for Culture of Safety.” Nursingworld.org. July 17, 2003. “Hospitals Fail to Protect Nursing Staff from Becoming Patients.” Npr.com. February 4, 2015. “Nursing Fact Sheet.” Aacn.nche.edu. May 14, 2015.